Fiction writers build new, but never wholly independent, worlds. Readers journey from the real world to the imaginary and return, changed. What, if anything, do the authors of these new worlds owe to their readers, to themselves, to the people and experiences they draw on in their work, to their art itself? Do writers of fiction have an obligation to be honest, in some sense, and, if so, what sense could that be? Should they strive to achieve some salutary moral or political effect in their real social context, or is that kind of moralism a betrayal of their art? Are there moral limits on the exercise of a writer’s imagination–perspectives from which she has no moral right to write, or ideas she has no right to represent? 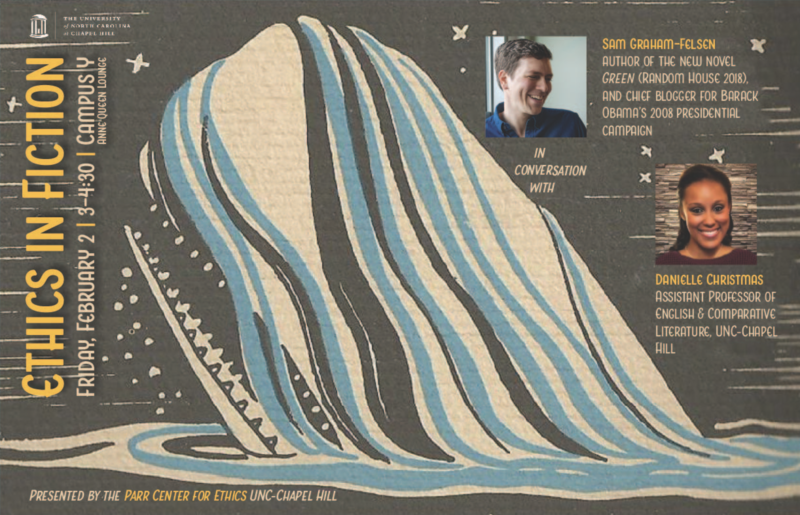 Sam Graham-Felsen, author of the recently released coming-of-age novel, Green (Random House, 2018), and former Chief Blogger for Barack Obama’s 2008 presidential campaign, discusses questions about the ethics of fiction in a conversation with Danielle Christmas, Assistant Professor of English and Comparative Literature at UNC.